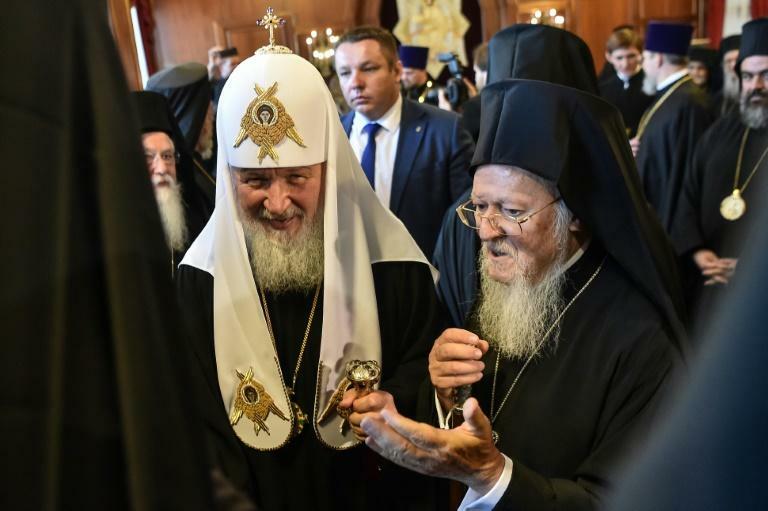 Ecumenical Patriarch Bartholomew I on Friday hosted Russian Orthodox Patriarch Kirill in Istanbul for hugely unusual talks focused on whether Ukraine will get an independent church, a move strongly opposed by Moscow. Bartholomew I, known as Archbishop of Constantinople, New Rome and Ecumenical Patriarch, is regarded as the "first among equals" of the world's estimated 300 million Orthodox Christian believers. He is expected to rule in the coming months on a Ukrainian appeal to cut spiritual ties with Moscow but Kirill, who has strong connections to the Kremlin and is seen as an ally of President Vladimir Putin, is determined to prevent this from happening. "The main question (at the meeting) was the situation in Ukraine," said Metropolitan Emmanuel of France, who was present at the meeting. He told AFP it took place in a "fraternal atmosphere" adding the two hour meeting's aim was to see "what measures could be take to contribute to peace in Ukraine". Later Metropolitan Emmanuel added that in April the Ecumenical Patriarchate took the decision of "exploring all the ways in order to issue the autocephaly to the Ukrainian Orthodox Church". "We are implementing already this decision, and this was also reported to Patriarch Kirill," he said in a televised comment, a move that could spark ire of the Moscow church. Were Moscow to lose control of the Ukrainian church, it would be seen as a blow to the prestige of the Russian Orthodox Church and Russian spiritual influence in general. Kiev hailed the Istanbul talks, with the country's Foreign Minister named the news from Turkey as "historic". "It seems that our fair aspiration to receive autocephaly and the support of the Ecumenical Patriarch Bartholomew forced the Russian Orthodox Church to... begin a dialogue with Constantinople," Pavlo Klimkin wrote on Facebook. Bartholomew is the primus inter pares (first among equals) of Orthodox churches across the world, including Greek, Russian, Serbian and Romanian. His degree of influence varies, but many consider him to the the spiritual head of the entire Orthodox faith. He remains known as Archbishop of Constantinople, in a throwback to the former Byzantine name of the city, which was only officially renamed as Istanbul in the 1920s after the fall of the Ottoman Empire. His term in office has been marked by rocky relations with the Russian Orthodox Church, which usually gives short shrift to the idea he is the spiritual leader of Orthodox believers.